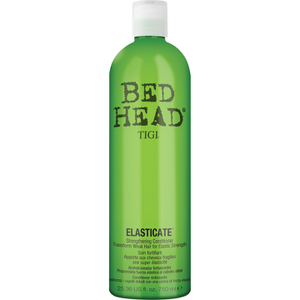 Prevent breakage with the TIGI Bed Head Elasticate Conditioner; a weightless conditioner developed to strengthen hair from root to tip. Enriched with Sweet Almond Oil, essential fatty acids and vitamins A and E, its unique formula softens, smoothens and promotes healthy hair growth to leave hair radiant and restored. Utilising Hydrolysed Wheat Protein and Lactic Acid to repair damaged hair, whilst amino acids work to transform lack-lustre locks for a voluminous style with enhanced texture. Reduces static and reignites luminosity so you can experience super-charged hair with added body and bounce. Subtly scented with blackcurrant, nectarine and pink grapefruit. E.N.